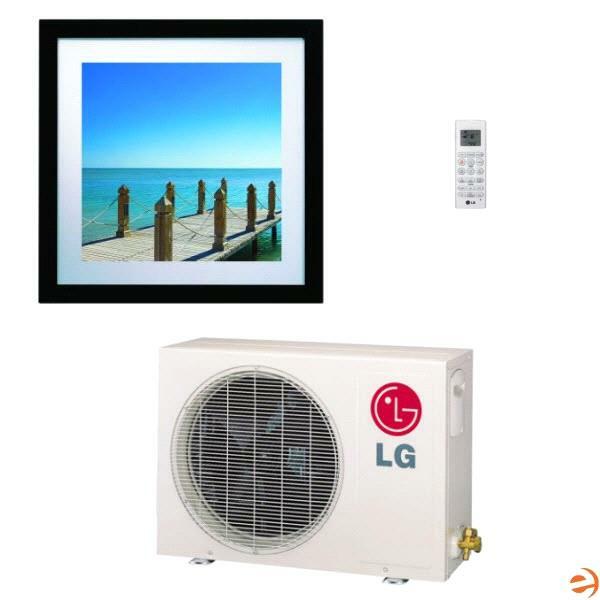 The LG LA120HVP Art Cool Gallery Wall Mounted Heat Pump Mini Split System is 16 SEER rated and includes (1) LAU120HVP Outdoor Condenser and (1) LAN120HVP Indoor Unit. This single zone system uses a heat pump to provide both heating and cooling to your home or commercial area while providing a more aesthetically pleasing backdrop to your room. LG Art Cool Gallery indoor units are designed to display artwork or photography. With a maximum heating capacity of 13,300 BTU/hour and a maximum cooling capacity of 11,200 BTU/hour, this LG system provides comfortable temperatures in most environments. Revolutionary inverter technology minimizes energy loss, improving the system's overall energy efficiency. The LA120HVP system includes a wireless remote control.